Salou, which is one of the many highly specialized tourist resorts located on the Spanish Mediterranean coast, is a hundred kilometres south of Barcelona. Within its narrow boundaries of 1.481 ha, Salou hosts 7.4 million overnight stays per year and is home to 52 hotels. A ratio which ranks Salou amongst the tenth most visited municipalities in Spain. Distance from Salou’s historical town centre, the area of Carles Buigas Avenue (CB) emerges as being the heart of the municipality’s tourism and leisure industry. Salou developed, as did so many other Spanish coastal touristic locations, during the sixties and seventies as a consequence of the increasing demand for sun and beach destinations amongst the European and Spanish middle classes. Unfortunately, the “ageing” of this built up area clamours for close attention today. The visible physi-cal degradation of the property is becoming a cause for concern and preoccupation amongst the main property owners and investors: public administration, hotel managers, shopkeepers and neighbours. Hotels emerge as the key problem within the set physical boundaries of this study. They occupy approximately 50% of the total land surface, 28 out of a total of 52 hotels within the town being con-centrated in that area. This accumulation of hotels also breaks the particularity of the predominance of second residences which is so customary along the Spanish Coast. This paper delves into the data and proposals obtained from analysing the public space of the CB area. Similarly, as a consequence of the previous analysis, a set of proposals for intervention are also presented. The proposals are conceived to be developed within different time scales, in response to political and social willingness and economic capacity. The objective of the work is to induce an urban and tourism paradigm shift in the area, thus facilitating the emergence of a new tourism model. Solu-tions are urgently needed to provide specific answers to a particular scenario, which has similitudes to those of other Mediterranean Coastal Developments specialized in tourism activities, which too, after being operative for more than forty years, are suffering from deterioration or abandonment. Despite it still being an open process, the study understands that due to the complexity of the com-mitted task and the scale of the area, the goal will require the active commitment and collaboration of the property owners (administration, hotel managers, investors and neighbours). Salvado, N., Lorenzo, D., De Rivera, I. 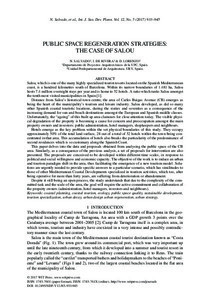 Public space regeneration strategies: the case of Salou. "International Journal of Sustainable Development and Planning", 18 Gener 2017, vol. 12, núm. 5, p. 933-945.